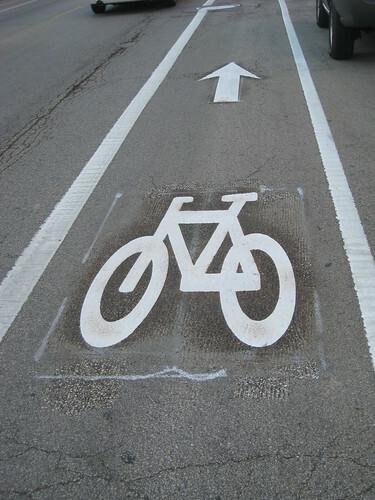 This week Chicago celebrates Bike to Work Week – a month after the National Bike to Work Week. 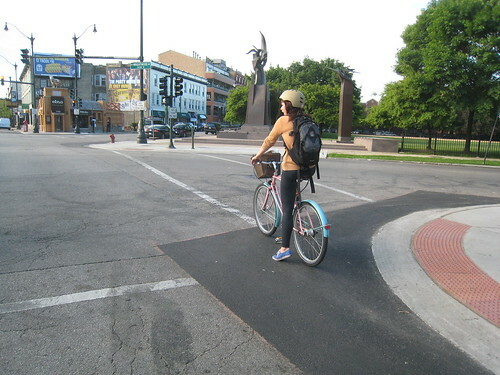 Usually by June Chicago has more favorable weather to attract more folks to get out on bikes. Friday morning is the Bike To Work Rally at Daley Plaza from 7-9am. The city invites all bike commuters to celebrate the bike as a mode of commuting. Join thousands of cyclists for live music and FREE continental breakfast provided by 7-Eleven. Also, all cyclists will receive a FREE T-shirt as well as use of the complimentary Kickstart by Mountain Dew Free Bike Valet. I try to attend this rally every year because each year I find myself reuniting with friends and meeting new bike friends. At last year (2012)’s Bike to Work Rally with bike friends. Except for the horrific storms in the Chicagoland area on Wednesday, this week has been a great week (weather-wise) to be on the bike (commuting or riding just for fun). To conclude the week of events, this Saturday Bike Chicago is hosting a feature event called Make Way For People Bike Tour. The Tour goes from 9:30am-12 noon; meet at Millenium Park. Register here. May every week be bike to work week for you. I love my Bike in all the months. Hello enthusiastic readers – year-round cyclists, beginner cyclists, or future bike commuters! Like the title above says, next week is Bike to Work Week! May is also the only month where you can cycle to work and get loads of freebies – safety tuneups, swag, blinkie lights, bike maps, and bike buddies. Check out Jack’s article for handy links. For the bike-commuters-to-be and fledgling velodactyls, the staff writers at Bike Commuters wanted to share some tips, inspiration, and motivation to make May’s Bike to Work Week the best. week. ever. Everyone remembers the first time they rode a bike, and our readers have told us how they got started pedaling to work, and it turns out Bike to Work Week is a great starting point! Let’s Bike – This year, Elizabeth presented the basics on bike commuting at her job. She asked our readers to give their advice to newbie commuters. As Ghost Rider says, “the comments are GOLD” in this one. 10 Bike Commuting Myths Dispelled – Jack’s buddy Alan Snel shines truth on all myths related to bike commuting. My Conversation with a Cop about Bikes, Traffic, and Safety Tips – RL hashes it out with his friend “Officer Ben” to discuss the legal stuff and how to bike commute safely within the law! Out of My Way, Boys! – This article is by Dottie from Let’s Go Ride a Bike. A funny read for Cycle Ladies getting pumped to tear up the streets! Commuting in Style (Pint-Sized Edition) – Matt gives some tips on how to bike commute with tiny humans (a.k.a. children). Friday Musings – Top 3 Must-Have Bike Commuting Accessories – Readers share their thoughts on their favorite commuter accessories. We know there are more out there, on our site and others, so please share more links in the comments box for any Rookie Commuter Readers out there getting pumped for Bike to Work Week: May 14th through 18th! Pedal Forward, Cycle Ladies and Gents! Lookin' fly, Priscilla! Bike to Work Week with your DOG! Friday Musings: What Got You Pedaling? Mir.I.Am April 20, 2012 27 advocacy, Articles, Commute, Friday Musings advocacy, alan snel, Beginner Bike Commuters, bicycle memories, bicycles, bicycling, bike commuter, Bike Commuters, Bike to work week, bikecommuters.com, Commute, commute by bike, commuter, commuter bike, Commuter Bikes, league of american bicyclists, May 2012, national bike month, transportation cycling, why commute by bike? New Recruits: May is just around the corner, and so the creeper approaches: National Bike to Work Month! And, like every fun-loving, zero-emissions, two-wheeled, “coffee + eggs = bike fuel”, transportation cyclist, I always wonder if this year’s Bike to Work Month will bring new commuter faces beyond the month of May. Yes Velodactyls, this is what keeps me up at night (either that or the heaping tablespoons of Nutella I shoved in my face post-dinner). How can we get more people to commute by bike? May 2012 will be a barrage of Bike to Work Week challenges, workshops, rallies, and bikey SWAG, as local bike organizations shotgun their way through possible Spring recruits. Our own star staff writer Elizabeth posed the question in 2010: We all know bike commuting is the best thing since the Jammy Shuffle, so why aren’t more people doing it? I gotta admit, I’m on bike commuting like a woman on smack, so I surely don’t know the answer! Calf-Envy, this is RL when he commutes sans SPDs. Minority Report: As the minority, commuter cyclists face the same puzzled looks from co-workers, semi-sweet concerned lectures from loved ones, and blatant stares of calf envy (hello Mr. Officer, I’m up HERE) as we think to ourselves – if only you’d know the glories of the dark side, you’d be out of excuses and on a bike too! Nevertheless, we’ve had some progress. Last year, this Atlantic Cities article reported increased bike ridership across the U.S. (If you like colorful graphs, you should definitely click the link to this article). Overall, a universal increase U.S. Bike Commuters over the past decade! I'll take it! Converting to bicycle commuting is all the rage in U.S. cities, if the proliferation of blogs devoted to the topic is any indication. But we wanted to know: Just how big have increases in the percentage of bike commuters been in specific cities? Are there regional differences? Cities where bike commuting isn’t catching on at all? We surveyed 55 major U.S. cities to see if we could find the answer. While there are stark differences across individual cities, taken as a group these metros saw an average increase in their percentage of regular bicycle commuters of 70 percent between 2000 and 2009. The chart-laden article concluded that Portland had the highest percentage of trips taken by bike at 5.8% with a 222% increase from 2000 to 2009 (Don’t make me graph battle you, Portland.) I can say for my office, the percentage of riders has increased since I started three years ago from 1 out of 16 to 6 out of 16! HUZZAH! Majority Report! Best Monday of my life: 7 bikes for 10 employees at the office... fist pump. My question today is what got you pedaling? We weren’t all born on fetus-sized bikes so it had to start somewhere! A lot of bike commuters have shared our first bicycle memories, but what converted you to utility cycling? Was it a Bike to Work Month challenge, an enthusiastic bike-loving friend, a hand-me-down bike, a car in the shop, or an inspirational blog on bike commuting (hint, hint!)? Safety in numbers means that bike commuters need more bike commuters! So, muse along with us and share your thoughts! 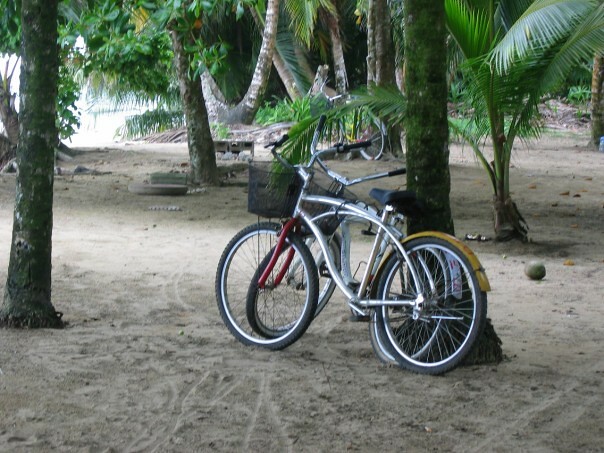 Best parking spot at the beach - that's what's got me pedaling! Needless to say, everyday for me is bike to work day and every week is bike to work week. But here in Chicago, the Active Transportation Alliance puts together a fun line-up of Bike to Work activities – purposely in June when the “iffy” May weather is behind us and we hopefully have sunnier skies and warmer temperatures to brighten up our daily bike commutes. This week is the Bike Commuter Challenge in which businesses “compete with other businesses to get the most employees biking to work during the Bike Commuter Challenge, June 11-17.” Active Trans is behind this challenge and the concept has grown over the years; this year more than 400 teams are signed up as of this posting. For more info about registering your Chicago area company / school / nonprofit for the challenge, go to the registration page. Winners are determined by the percentage of team members who biked to work during the Bike Commuter Challenge at least once. Participation is scored when someone bikes part or all of the way to work. Even if your officemates bike to the closest train stop, that counts as participation. You can likely find me this week helping out at one of the many bike pit stops organized for morning commuters throughout the city and suburbs. In fact, my own company hosted its own bike commuter stations this morning to rally employees to bike to work. Go Team — of all Bike Commuters! 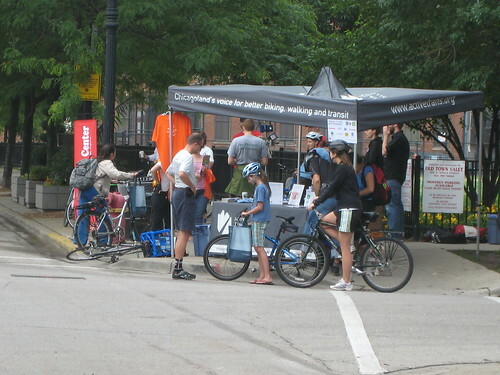 Chicago and the Active Transportation Alliance officially kicked off its bike to work week on Saturday, June 12, and will end with a Bike to Work Rally in Daley Plaza this Friday, June 18. 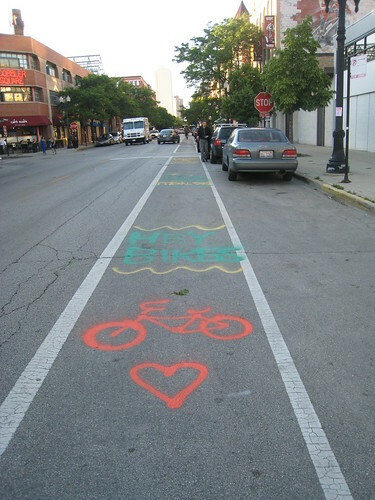 Just in time for Bike to Work week, Chicago striped some new bikes in a few bike lanes and Active Trans is sharing the bike love with commuters by promoting this week’s bike commuter stations. Be on the lookout for one along or near your morning route. 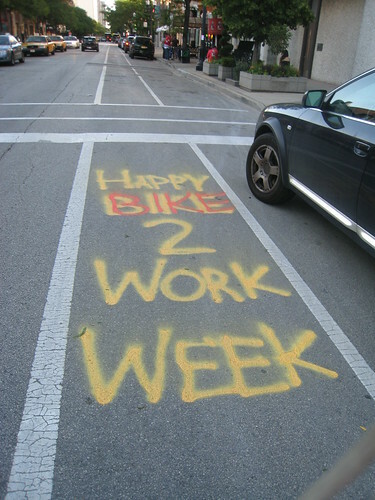 From Chicago — Happy Bike to Work Week! Has your company signed up for the Active Transportation Alliance’s Bike Commuter Challenge?